Building a WordPress website is a very difficult task even today. However, there are many simple ways to build the WordPress website such as plugins and themes. These tools make the work of WordPress developers easier. We have made a research to find the most appropriate steps in order to build the WordPress website. These steps are the ones that are suggested by the developers. This guide will help each and everyone even those who are creating the website for the first time. The guide is entirely a tutorial that will help the WordPress developers at every stage of developing the WordPress website. We begin with selecting a perfect Content Management System followed by choosing a domain and then the web hosting service. 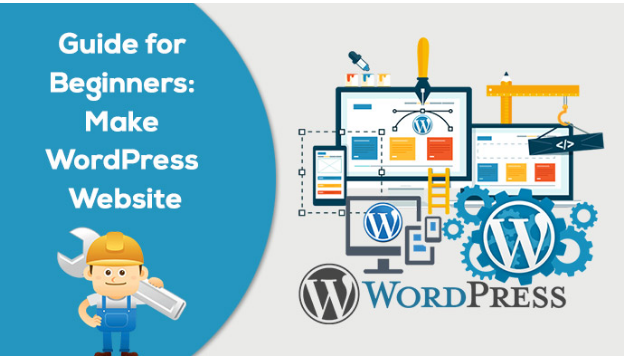 Overall, in order to create a customized and well managed website with the help of WordPress, this guide will help you to build a WordPress website precisely. Move on and find out if you can build a WordPress website! An Enterprise Content Management makes it easier for collaborating in the workplace with the integration of document management, document asset management and record retention functionalities. A Web Content Management builds collaborating authoring for websites. A CMS is not the only way till the end. You can even install a theme that is known to be a modified template which will suit the specific niche and purpose of your site. Along with the theme, plugins are also available through which you can add function to your site. There are a huge variety of CMS available on the internet to manage your digital content. So, choosing the most appropriate one from these is a big deal. Let us take a look on all kind of CMSs and their functionalities to find out which one would be the best for you. It is a free and open source Content Management System. It is built on Model View Controller web application framework. This is an appropriate CMS when you are looking to create a community of users. When compared to Drupal, it is easier to handle. It offers more than WordPress when it comes to the terms of performance and tweak ability. But, it is not the CMS preferred by most of the WordPress enthusiasts. So, let us move on to other CMSs. When compared to WordPress, Drupal is not highly suitable for the non technical people. Drupal is an open source framework written in PHP. It is a CMS that is utilized by large scale corporations with heavy websites and high traffic loads. The CMS has its own customization possibilities with the themes and plugins. This functionality creates an add value to the Drupal websites. It makes the website a bit faster and offers less taxing on server resources of the host. This CMS is more complicated than the other ones. It is especially designed for huge sized, complex websites. Hence, it won’t fit the requirements of your new website. As this guide is for the beginners, this CMS won’t be recommended for the readers. Let us now move on towards the functionality of the very well known CMS, WordPress. WordPress is an ideal option for the beginners. This CMS has considerable scalability and works perfectly with every kind of website. It is reported that there are over 1.5 million views every month. Some large websites like Time Magazine, CNN, TED, use WordPress to offer service to millions of pageviews every day. It is an Open Source platform with a strong community. It is ideal for tech savvy online entrepreneurs. Hence, you got the CMS for your website. Now, let us move ahead. While selecting the domain name for your website, you must be sure of the niche you want to concentrate on. The niche should be selected very wisely, and is a vital task for the business. Looking to create a revenue generating website? It is necessary to research the targeted keyword pool and the niche from which it is derived. There are some of the most popular domain name extensions. But, these days, there are various new domain name extensions introduced across the internet. There are certain steps to focus on, while selecting a right demo. It should be catchy and people must not forget them. It should represent the niche of your business. Similarly, selecting the host for your website is equally important. It is recommended that a shared hosting plan should be preferred for the first time webmasters. There are basically two types of hosting plans, Shared hosting & Managed WordPress hosting. You can find a huge variety of hosting providers out there. They will provide paid as well as free hosting plans for the best possible hosting services. Post creating the WordPress website, don’t forget to customize the website according to your requirement. Make it more beautiful by using the relevant themes. You can make use of widgets to make the functionality of the website easy to use. Add new plugins and pages if required. Make the background entirely user-friendly such that it also provides a whole new appearance to your WordPress website. These are some of the steps which you can follow in order to build a WordPress website. Follow the steps and create a wonderful website.